Gavin Souter tells the story best in Mosman : A History and it begins with the Presbyterian church on Belmont Road, now known as Scots Kirk, and its second Minister. Reverend Donald Peter Macdonald was ‘a man of wide interests’ with “the gift of creating great occasions when the people thronged to hear him.”1 He was later to enter political life as Mosman’s member of the State Legislative Assembly. Macdonald served as padre with the 2nd Division Artillery in France from 1917 and a fine portrait photograph from this period hangs in a vestibule of the church. One of Macdonald’s most notable undertakings was literally just that, for it was a funeral which evoked the most intense communal emotion ever displayed in Mosman. The depth of public feeling aroused by the death of Flight-Lieutenant Keith Anderson in 1928 is something not easily understood by a later generation. It had to do with the pride so widely taken in the international achievements of Australian aviators, but that alone does not fully explain the extent to which Anderson’s tragic death was memorialised. In D.P. Macdonald’s mind the Anderson Memorial may also have been inspired by the Great War and by Mosman’s Scottish heritage. The airman was educated at South African College and when he was 18 years old there was, in South Africa, Major Alastair Miller, whose mission was to enrol recruits for the Royal Flying Corps, the Great War having been in progress nearly two years at the time. In the enrolment of cadets Keith Anderson was one of the first chosen, and he removed to England to continue his training and securing his commission, was in France before the end of 1918. During the war he handled several types of aircraft, among them the Maurice Farman, Avro, Sopwith “Pup“ and “Camel,” De Havilland, 6, 9, and 9A, and the BE2 2E. Although he was not actually wounded Anderson suffered from shell-shock. He had many thrilling skirmishes with enemy aircraft, but a natural modesty made him disinclined to discuss his experiences in France. However, it is known that he was responsible for the downfall of no less than nine German machines, but army practice demands that corroboration shall be forth coming of victims brought to earth, and although five of Keith’s were identified it was impossible to confirm the others, otherwise he would have qualified for the decoration awarded to the allied airmen responsible for the destruction of six German ‘planes. Flight-Lieutenant Keith Anderson’s service record suggests2 he saw action between Cambrai and Saint-Quentin where low level strafing was carried out by 73 Squadron. In 1918 he was with the Independent Force, RAF who undertook long range bombing missions against railways, aerodromes and other industrial targets in France and Germany. [A]fter the armistice he returned to South Africa, eventually coming back to Australia in 1921… He joined the Westralian Airways Ltd, in 1922, and for two years was pilot on their North-west air mail route. That famous first flight across the Pacific was initially a joint venture between Anderson, his longtime friend and fellow WWI pilot Charles Kingsford Smith, and Charles Ulm, a Mosman boy. The story is too long to tell here but Anderson and air mechanic Bob Hitchcock were replaced by two Americans at the eleventh hour, and the acclaim that greeted the successful crew of the Southern Cross led to rancour and a court case. Anderson lost, but Kingsford Smith made an out-of-court settlement of 1,000 pounds. In a tragic irony, Anderson used the money to buy the Kookaburra. Following the Pacific flight they [Anderson and Hitchcock] had unsuccessfully attempted to sue for shares in the venture’s profits. Remarkably, the whole episode had not completely soured the relationship and when Southern Cross went missing, Anderson and Hitchcock agreed to join the search. Early in April, 1929, Keith Anderson in his ‘plane the “Kookaburra” with Mechanic Hitchcock hurriedly left Sydney to the rescue of fellow airmen, then missing in North West Australia. When over the treacherous desert country in Central Australia (Lat. 170° 56’, Long. 132° 18’)3 the engine failed and the “Kookaburra” was forced to land there, never to rise. After many anxious days the ‘plane and the bodies of these gallant men were found by Pilot Lester Brain, A.F.C, of Quantas, Queensland, and their brave story was written there by Keith Anderson on the tail of his machine. The remains of these noble flying men were recovered for burial from the desert by Flight-Lieutenant Eaton and other brave men, who endured great hardships in rhe undertaking. Mechanic Hitchcock’s remains were taken to Perth, W.A., for burial there, and Lieutenant Anderson’s last resting place will be on beautiful George’s Heights, a site granted by the Council of the Municipality of Mosman. 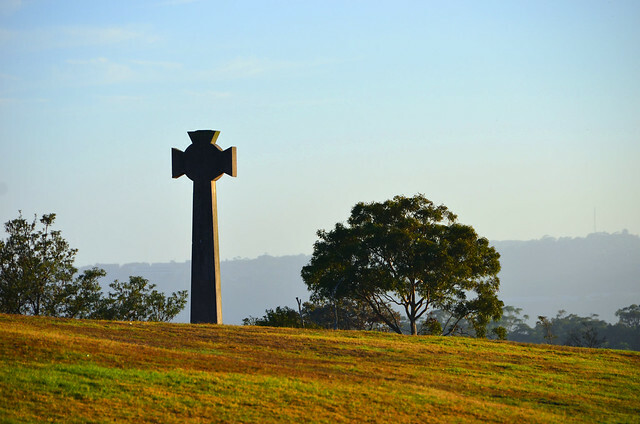 Burial at Mosman — why? By the time Anderson’s body reached Sydney on 29 June the general desire – endorsed by his fiancée, Miss L. M. Hilliard, and her parents, all of whom lived in Mosman Street – was that he should be buried in Rawson Park, the most majestic site in all of Sydney, overlooking Georges Heights, Middle Head, Middle Harbour, North Harbour and Port Jackson. The idea was D.P. Macdonald’s. Whether the minister had known Anderson or his fiancée personally is uncertain, but once the thought of a grave and memorial in Rawson Park had occurred to him he urged it upon the Council with all his accustomed vigour. Burial of the body of the late Keith Anderson. Dated 3rd. July, 1929. In this connection the Mayor was approached relative to a site being made available for this burial in a portion of Rawson Park. The Mayor consulted all the Aldermen immediately available and it was decided that the site be provided subject to necessary arrangements being made with the various authorities. Subsequent to an interview which the Mayor and Town Clerk had with the Minister for Lands, the matter was referred to Cabinet which decided not to offer any legal objections, in view of the representations put forward on behalf of this Council. The selected site is outside the park enclosure, on high unenclosed ground which is visible from a very wide area. The burial which has been arranged by the Commonwealth Government is to take place on Saturday morning next. In a resting-place that is befitting a national hero – on high ground between Sydney Harbour and Middle Harbour, facing the sunrise – the body of Flight-Lieutenant Keith Anderson was laid away on Saturday morning. As the coffin was borne from the Mosman Presbyterian Church to Rawson Park the nation paid homage to the memory of a brave man. Governments and public bodies, war establishments, and the Institutions of peace were represented officially. Soldiers walked with arms reversed before the gun-carriage which bore the airman’s body, blue-clad mechanics of the Air Force marched on either side, a Minister of the Commonwealth walked bare-headed among the chief mourners, aeroplanes swooping down to near the level of the tree tops, dropped wreaths and flowers. But the most remarkable tribute, because it was entirely spontaneous, came from the people. They gathered in thousands in the quiet suburban street before the church, and in thousands followed the cortege over the rough track to the high, open space where the grave had been dug. There was no demonstration, no talking. They came, simply and quietly, to say farewell to one of those young Australians who have made Australian aviation famous for all time. In honouring his memory the people paid honour to the courage and the ability of the whole splendid band of Australian aviators. As the cortege proceeded at a slow pace to Rawson Park three squadrons of aeroplanes and two or three single machines (thirteen in all) manoeuvred overhead, and dropped wreaths and flowers. The five Moths, which led, flew in the form of a cross. The squadrons kept fairly high, and made wide circles while the funeral procession moved slowly through the crowded streets, but individual machines continually came down close overhead They had all been flying over Mosman for more than an hour by the time the coffin reached Rawson Park, so, with a final “dip,” as a mark of respect to their lost comrade, all except one flew off towards Mascot. That one, a Westland III monoplane, continued to fly backwards and forwards above the park, and just before the coffin was lowered, the pilot came very low and dropped his tribute, a wreath of red flowers and green leaves, almost on top of the coffin. It was a little incident that seemed, somehow, to typify the wonderful brotherhood of the air. In a grave that was a bower of gum leaves, ferns, violets, and moss, the remains of Lieut. Anderson were laid to rest on a rocky elope of George’s Heights. While fourteen planes droned overhead 6000 people heard the Rev. D. P. MacDonald read the burial service. One year later, a monument was raised above his grave. 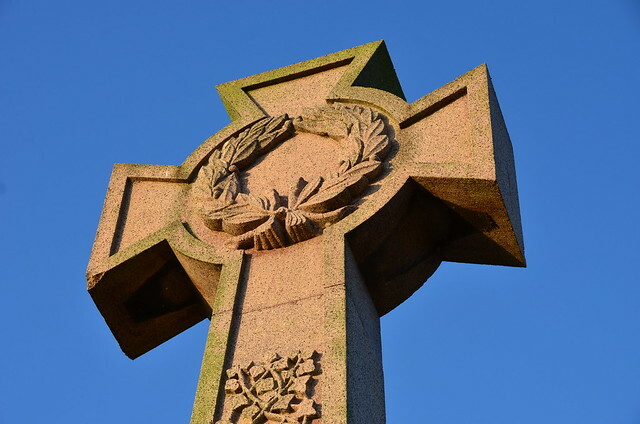 The cross recalled the many monuments that had been erected for the First World War fallen. 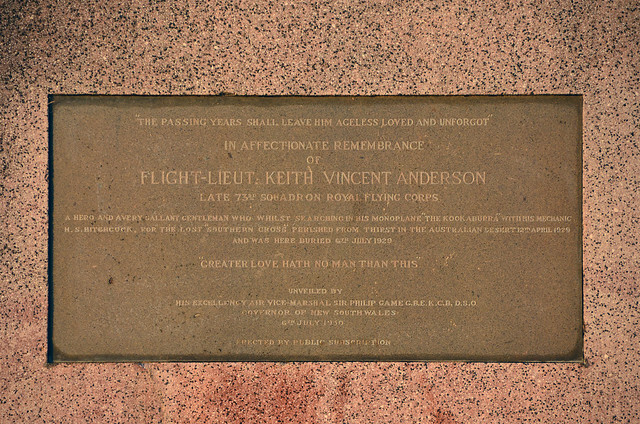 “The passing years shall leave him ageless loved and unforgot” / In affectionate remembrance of Flight-Lieut Keith Vincent Anderson, late 73rd Squadron Royal Flying Corps / A hero and a very gallant gentleman who whilst searching in his monoplane “The Kookaburra” with his mechanic H S Hitchcock for the lost “Southern Cross” perished from thirst in the Australian desert 12th April 1929 and was here buried 6th July 1929 / “Greater love hath no man than this” / Unveiled by His Excellency Air Vice-Marshall Sir Philip Game G.B.E. K.C.B. D.S.O. Governor of New South Wales 6 July, 1930 / Erected by public subscription. And spare a thought for the Minister whose energy made its mark on Rawson Park. 3 The 1929 In Memoriam gives the latitude an extraneous ‘0’, perhaps a typesetter’s error. The coordinates 17° 56’ South, 132° 18’ East place the crash site near Wave Hill station in the Tanami Desert. Errol Martyn, Gareth (Dolphin) and Mick Davis, Great War Forum, for help with Anderson’s RFC/RAF service record. Sources included RAF Flying Training and Support Units since 1912 by Ray Sturtivant, rafweb.org and ww1aero.org.au. Bill (WhiteStarLine), Great War Forum, for debugging crash site coordinates. This photo could have been taken from the first floor of the Buena Vista Hotel, looking west or north-west. The lower street would then be Prince Albert. What do you think? Would suggest NE Area for disposal in No.18 Group for the 6.1918 entry. Seems like home authorities didn’t, at first, know what to do with an ex Camel pilot. 14 TDS at Lake Down was dedicated to turning out day light bombing pilots and 1 SNBD at Stonehenge was the ‘finishing school’ for such types. His later posting to 20 Group makes sense. 32 TDS at Montose, 26 TDS at Edzell and 2 TDS at Gullane were all scout training units. Formed in Administrative Wing at Farnborough 29.1.1915. To Northolt 1.3.1915. To 7th Wing 13.12.1915. To 18th Wing 25.3.1916. Designated as an Elementary Reserve Squadron and establishment at 23.12.1916 set at 18 MF or GW XV. Disbanded into 30 TDS at Northolt 15.7.1918. Avro 504 792, 2892, 4025, 4026, 4255. MF Se.11 515, 533, 2451, 2466, 4232, 4729, 5885, 5888, 7064, A540, A929, A2177, A2182, A2448, A2526, A2527, A6805, A6839, A6851, A6900, B1969, B1983, B1992, B3988. Martinsyde S.1 2827, 4232, 4235, 4246, 4249, 5446. RAF BE2b 666, 2177, 4161, 4202, 4718. RAF BE2c 1674, 1791, 2048, 2088, 2089, 2092, 2112, 2117, 4110, 4112, 4150, 4161, 4711, 4718. Formed at Catterick 24.7.1917 with nucleus from 6 TS. To Harling Road 7.8.1917. To Upper Heyford 17.7.1918 and disbanded 29.7.1918. Intended to reform at Fowlmere, 11.11.1918, then at Wyton and then Leeds and finally at Chingford 14.12.1918 but none of these events occurred. Major AC Clarke from 26.12.1917. Avro 504A/J B3236, B4260, B4332, B4376, B4379. RAF SE5a C5362, D264, D3560, E1377, E1378, E1379, E1380, E1381, E1382, E1383, E1384, E1385, E1386, E3964, E5967, E5968, E5969, E5970, E5971, E5972, E5973, E5974, E5975, E5979, E5980, E5987, E5990. Sopwith Pup B5287, B5306, B5925, B5952, B5955, B6008, B6101. Sopwith Camel B5201, B7336, B9244. Formed at Turnberry 1.1917. Disbanded into 1 SAF & G Turnberry 1.5.1918. RAF BE2c 2720, 2766, 5416, B4020. RAF BE2e B4020, B4500, B4495, B4496, B4497, B4499, B4500, B4562, B4564, B8845. RAF FE2b 4926, 4966, 6975, A788, A817, A5504. Sopwith F1 Camel B9204, B9210, B9222. Formed with HQ at Rokeby, Waine-a-Long Road, Salisbury 5.8.1917 by re-designating the Southern Group Command. Controlled the 4th, 17th, 18th, 21st and 33rd Wings. Re-designated 7 Group 1.4.1918. Formed in 33rd Wing at Lake Down 6.6.1918. Autumn 1918 establishment 36 DH4/9 + 36 Avro. Re-designated 14 Training Squadron 6.1919. Airco DH9 C1336, C6064, C6156, C6317, C6325, D1065, D1068, D2777, D3090, D3102, D3105, D7308. Avro 504J/K D8801, D8802, E1849. RAF BE2e A3140, B4576, B6195, C7147. Formed in 25 Group at Turnberry 29.5.1918 by re-designating 1 SAF&G. Autumn 1918 establishment set at 24 Avro + 8 BF + 16 DH4/9 + 20 Camel. Disbanded 25.1.1919. Lt Col LWB Rees VC. Airco DH9 C1189, C1190, C1192, C1215, C1216, C1217, C1218, C1219, C1220, C1230, C1231, C1264, C1268, C1323, C1324, C1333, C1334, C1372, C1374, F1226. Avro 504J/K C5845, D87, D7583. Bristol F2B B1161, B1178, B1179, B1180, B1198, B1270, B1272, C4548, C4684, C4685, C4687, C4688, C4690, C4695, C4703, C4766, E2464, E2465. Bristol M1C C4914, C4940, C5010, C5011, C5012, C5013, C5014, C5015, C5016, C5017. RAF SE5a B678, C8881, C9586, D347, D411, D413, D3427, D3433, D3435, D3457, D3458, D3944, E3954, E5990, F5586, F7956, F7958, F7966. Sopwith Pup B5287, B6034, C289, D4154, N6205. Sopwith F1 Camel B5560, B6398, B7479, B9212, B9262, D3367, E7181, E7225. Sopwith Dolphin C3783, C4120, E4437, E4438, E4466, E4482, E4504. SPAD S.VII A9139, A9140, A9141, A9142. Formed at Stonehenge 5.1.1918 by re-designating 2 TDS. Disbanded into the School of Air Pilotage 23.9.1919. Airco DH4 A2136, A7871, A8002, B2120, B2150, B5483, B5484, B8091, B8125. Airco DH9 C1320, C2163, C2171, C6082, C6118, C6125, C6128, D1677, D5681, D5804, D7135, E9676, F1161, H4273, H4274, H4276. Airco DH9A E8554, E9669, E9671, E9681, F973, F975, F1075, F1635, F2746. HP 0/400 B9446, B9447, B9448, C3494, C9642, C9661, C9671, C9684, C9686, C9689, C9755, D5436, D5448, D4563, D9685, D9686, D9696, D9710, D9725, D9755. MF Se.11 B1951, B1993, B2031. RAF BE2e B3716, B4498, B6155, B8847, B8853, B8854, B8896, B8899, C6939, C7003, C7008, C7103, C7105, C7123, C7125, C7127, C7130, C7131, C7137. RAF FE2b A5585, A5752, A5760, A5768, A5769, A5772, A5775, A5776, A5785, A5792, A5793, A5794, A6543, A6551, A6564, A6585, A6589, A6595, A6596, A6598, B1856, C9800, C9818, D9081, D9101, D9103, D9154, D9754, D9768, D9780, D9782, D9787, D9953. Formed in 30th Wing at Montrose ex 6 TS and 18 TS. Autumn 1918 establishment set at 36 Camel + 36 Avro. In 20 Group by 11.1918. Disbanded 30.5.1919. Avro 504A/J B4352, B8671, B9452, C566, D137, D163, D195. Avro 504J/K C4398, D4350, D4417, D4420, D5855, D7152, D7392, D7753, D7798, D8292, D8294, D8296, D8297, D9572, E1607, E1608. RAF SE5a B135, B136, B8571, C5373, D255, D3497. Sopwith Pup B2201, B2203, B5965, B7573, B7575, C235, C285, C288, D4023, D4025, D4027, D4028, D4030, D4032. Sopwith F1 Camel B2504, B5185, B5250, B5555, B5617, B5618, B6218, B7136, B7177, B7323, B7371, B7422, B7455, C14, C81, C102, C1602, C1604, C1608, C1612, C6732, C6752, C6753, C6755, C6756, C6757, C6760, C6763, C6764, C6765, D6676, D6678, D8134, D8232, D9515, D9575, E1440, E1441, E1442, E1443, E1444, E1445, E1448, E1449, E1523, E1527, E1583, E1584, F4207, F8652, F9574. Formed in 20 Group at Edzell 15.7.1918 ex 36 and 74 TS. Autumn 1918 establishment given as 36 SE5a + 36 Avro. Disbanded 25.4.1919. Sopwith F1 Camel B7271, C6752. Reformed in 30th Wing at Gullane 15.4.1918 with initial machines ex 6 TS and 18 TS. Autumn 1918 establishment intended as 36 SE5a + 36 Avro. Disbanded 21.11.1919. Avro 504A/J/K A527, B3165, B4206, C4483, C4393, C4493, D44, D176, D195, D198, D527, D4413, D4418, D4461, D4462, D4464, D5851, D5853, D5887, D5948, D5950, D7699, D8299, E336, E1606, E1610, E1640, E1641, E1643, E1644, E3405, H229. RAF SE5a B135, B136, C5373, C8881, C9044, C9051, C9054, D3450, D3497, E1355, E3932, E3952, E4044, E5784, E5848, E5854, F883, F5633, F5637. Sopwith Pup B5349, B5350, B5379, B7496, D4027, D4028. Sopwith F1 Camel B5613, B7421, D6672, D6874, D6876, D6678, D6680, E1447. I have always found the story of the Mosman Memorial fascinating – why was Keith Anderson buried there when everyone else was buried elsewhere? Fortunately, I have had this question and many more answered over the years. I thoroughly enjoyed this piece, it compiled a lot of the information I myself had learnt over the years, as well as provided me with a few tidbits that I wasn’t aware of. It was very well written, thank you. Brilliantly written. Also google a blogg Keith Anderson WW1 Aviator. Gavin Souter has the date of Anderson’s death as 1928, when it was 1929. Ironically Souter’s error is immediately above a photograph of Anderson dated 1929.